You gotta love the Mings. They were the ones who transformed Beijing from a village into a city and gave it its name! Ok, well, Kublai Khan had made this spot his seat of power when he was emperor. But most of his town was razed when General Xu Da drove the Mongols out of China on behalf of Zhu Yuanzhang. He became the first emperor of the Ming Dynasty in 1368. His grandson, Yongle came to power after a bitter civil war. He decided to punish the people of Nanjing (the capital city at the time), who had supported his uncle. He killing thousands and moved the center of government. To the north. To Beijing, which means, not terribly originally, northern capital. For almost 20 years (1403 -1421) he went crazy building the perfect city. He expanded and improved the Great Wall and built the Temple of Heaven. He also constructed the Forbidden City as his ultimate palace. It took 14 years and used the labor of over a million workers. According to Fung Shui it is good to build your house to the south of a hill. Unfortunately Beijing didn’t have any hills. No problem. The emperor simply had one made . 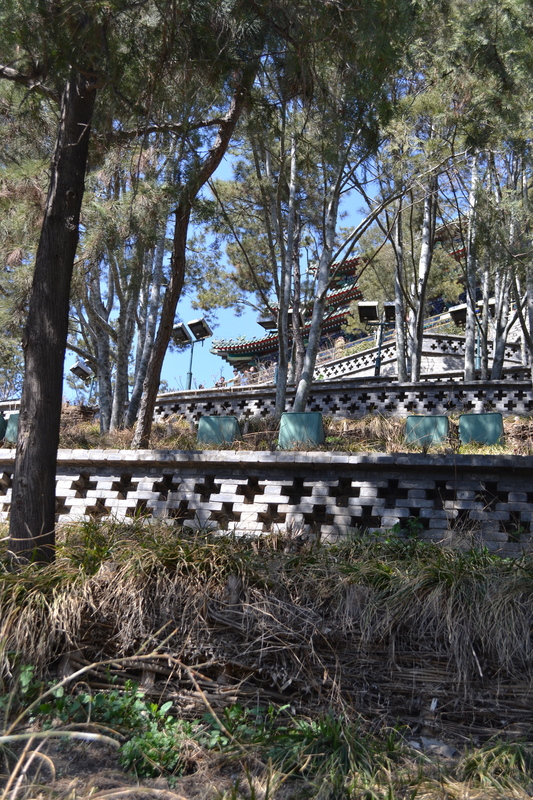 The Chinese call this hill Jingshan (Prospect Hill) but we foreigners all call it Coal Hill. Once upon a time coal was rumored to be stored at its foot. It is one of my favorite spots! The Forbidden City, aka the Old Palace, consists of hundreds of buildings surrounded by a huge barricade. This wall is in turn surrounded by a big moat, 6 meters deep and 52 meters wide, which was dug by hand. All the excavated dirt had to go somewhere…. 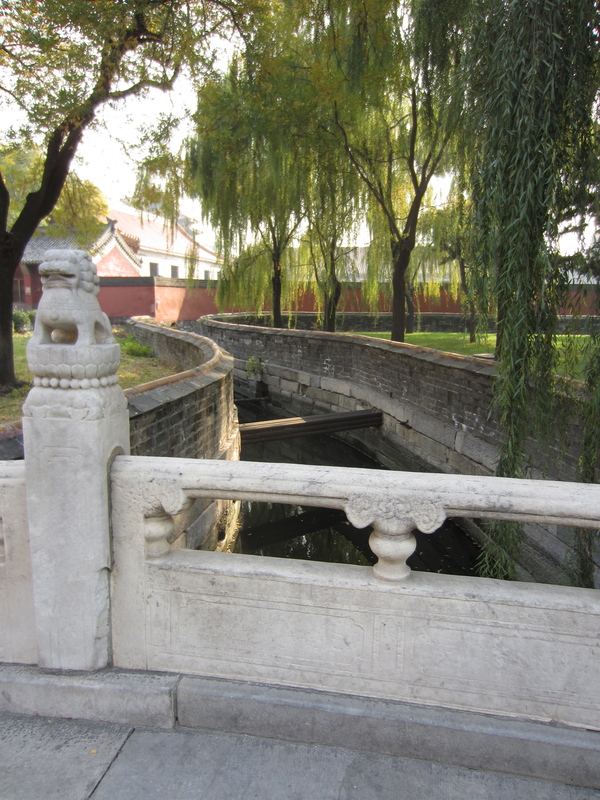 Emperor Yongle used it to create a big hill just outside the northern gate of his new home. Not only was it good fung shui but it was said to keep away evil sprits. It also helped block the biting wind that comes from the northern desert and still chill the city now. 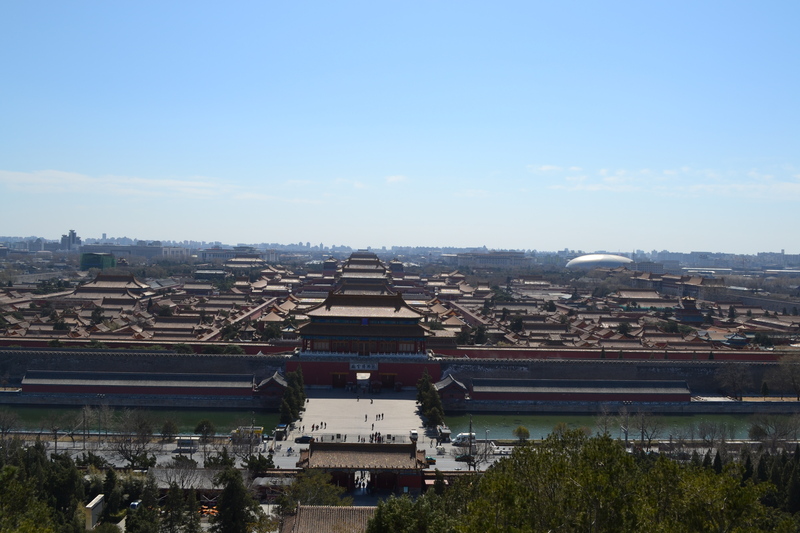 (None of the buildings in the Forbidden City open to the north). 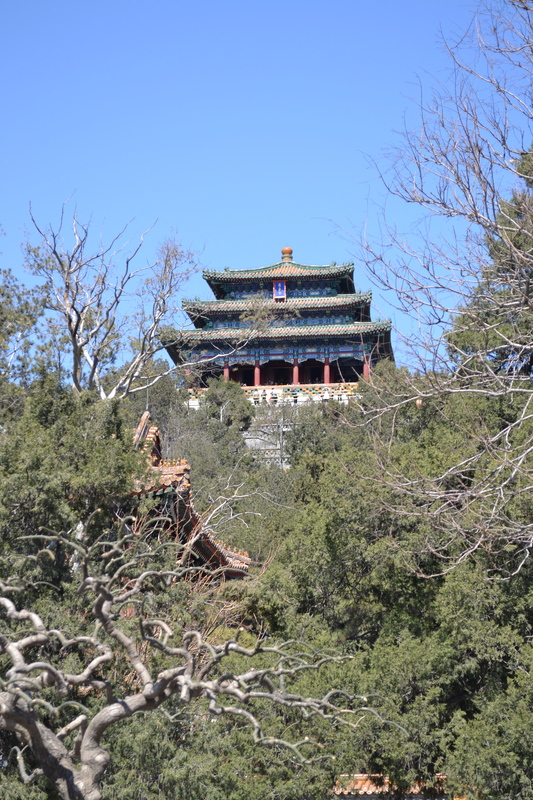 The middle of the five peaks, which make up this hill, is the highest point in Beijing and has amazing views. The emperor covered his hill with magnificent trees and flowers. Royal Families used it as their own private pleasure garden for wandering, escaping the heat, hunting and praying. Coal Hill also marks the spot where the last Ming emperor breathed his last. Chongzhen, the 16th Ming, gathered his family for a feast then killed all of them before the invading Shun warriors could capture them. All, that is, except one daughter, Princess Chang Ping; he just chopped off her arm. She fainted, fell under other bodies, survived and went on to become a myth. After slaughtering his relatives, Chongzhen dashed to Coal Hill and hung himself. It was 1644 and he was only 33 years old. The spot is marked with a tree (though not the one he used) and a plaque. Like the Forbidden City, only those chosen by the Emperor were allowed to enjoy Coal Hill until 1928 when it was finally opened to the public.